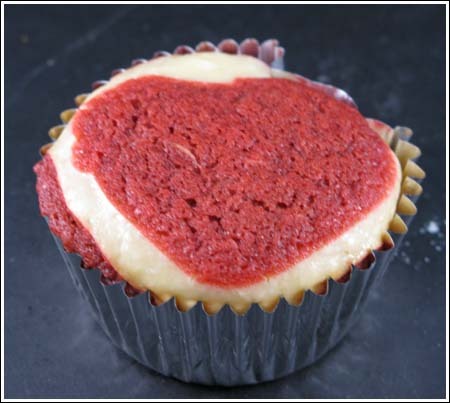 Red velvet flavored brownie with cream cheese baked in a cup. Preheat oven to 350 degrees F. Line 8 muffin cups with paper liners. In a second mixing bowl, stir together oil, sugar, vinegar, egg, red food coloring, vanilla and sour cream. Mix very well, then add flour mixture and stir just until blended. Double the recipe for more cups.